Trevor from No Bananas Fishing Charters was out slaying some salmon today at Constance Bank, off Victoria. 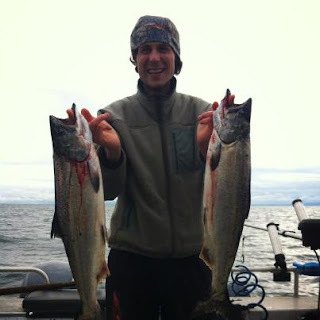 He was taking Andrew from the Yukon out for a late winter Vancouver Island fishing adventure. Trevor reports: "It was a nice calm morning and on the ride out Andrew asked if we ever see whales? My answer, not this time of year. So 5 minutes later we're pulling up to Constance Bank and there are 3 orcas feeding away. Great!! The fishing was pretty good with multiple hookups in the first hour, then slow for an hour, then we got back into them. We were fishing with pink and purple haze squirts right on the bottom." So there you go ... there's salmon out there, time to get out there and chase them! Halibut opens on March 15th, lots of exciting anglers looking forward to a chance at those delicious flat fish.